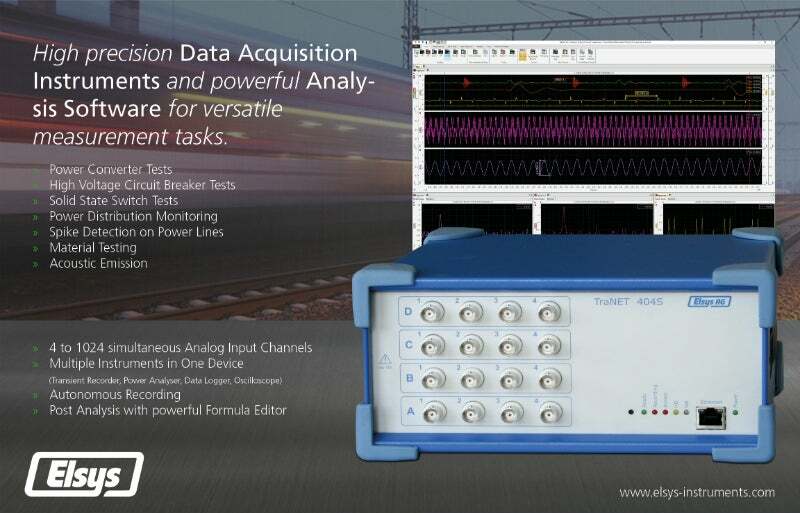 Elsys offers fast, high-precision data acquisition (DAQ) instruments and solutions. The company’s products are successfully implemented in a wide range of rail applications to promote efficiency and output-driven developments. Fast sampling rates from 2MHz to 240MHz make the product suitable for material and power converter testing, power line monitoring, and many other applications where fast transients occur. Elsys’ DAQ solutions are turnkey measurement instruments that require no advanced programming knowledge. The intuitive measurement software TranAX enables easy measurements, data analysis and reporting. Complex measurements and reporting tasks can be prepared in advance, allowing clients to focus on their applications during tests. Elsys provides simple four-channel DAQ cards that can be installed in standard computers or original equipment manufacturer (OEM) applications. If a higher number of channels are needed, the company offers the robust TraNET FE devices, which are extendable from four to 32 channels. Suitable for field measurements or service and maintenance tasks, Elsys’ compact solutions are mobile for on-the-go maintenance. Larger systems can either be built in a standard 19in industrial chassis or by synchronising several smaller devices. Elsys’ fully autonomous DAQ instruments can also be used as data loggers and accessed remotely online. A sophisticated measurement mode called ECR enables the system to be triggered by sporadic events, which it stores directly on an internal solid-state disc. Included in the TranAX measurement software, Elsys’ powerful Formula Editor provides a large set of predefined post-analysis functions, such as low-band or high-pass filtering, as well as root mean square (RMS), CosPhi, CrestFactor or Power Factor calculations. For more sophisticated analysis, standard programming functions such as loops, if-else constructs or sub-functions are available. A total of 60 predefined functions are included. Calculated results can be either visualised directly in TranAX waveforms or exported in many different file formats. Elsys develops high-precision DAQ cards with typical DC errors smaller than 0.1% of the full-scale range, making them more accurate than standard DAQ products. Introduced in 1995, Elsys’ products have been continuously enhanced and adapted to meet customer requirements. The company has delivered systems that are still in service after more than ten years. Beside its DAQ instruments, Elsys also offers several measurement-related products, including high-speed strain gauge amplifiers, low-noise signal amplifiers, trigger signal generators, and reluctance to transistor-transistor logic (TTL) signal converters. The company also offers high-voltage precision attenuators for voltages up to 1,000V, with 20:1, 100:1 and 1,000:1 attenuation. Elsys’ flexible DAQ solutions can be adapted with customer-specific modifications, such as a modified instrument chassis, the integration of additional third-party hardware, or additional TranAX software functionality. Several open-software interfaces enable the Elsys DAQ solution to be integrated in almost any customer-specific environment. If any support is needed, Elsys can provide software integration support in various programming languages. Complex measurement flows, analysis and reporting demands can be prepared and supported by Elsys directly to accelerate and simplify measurement tasks. Elsys AG has released the AE-Amp broadband preamplifier for AE sensors from a range of manufacturers. Elsys AG has a worldwide acceptance in high-precision and high-speed data acquisition solution systems. The next generation of Elsys strain gauge amplifiers now offers USB configuration and auto-offset compensation. Elsys has expanded its family of TPCE data acquisition cards with a galvanic isolated input stage. The isolation voltage is 400V RMS or 560DC, with a maximum common voltage of 60V DC. The integrated ICP / IEPE power source enables simple integration of ICP / IEPE sensors into the measurement system. The products and services of Elsys have been successfully certified according to the quality management system ISO 9001: 2015. Elsys has always focused on high quality and customer satisfaction.